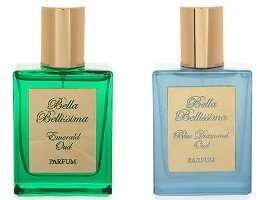 UK niche line Bella Bellissima has launched three new oud fragrances: Emerald Oud, Blue Diamond Oud and Ruby Oud. Emerald Oud ~ "Emerald Oud parfum by Bella Bellissima is a floral, amber woody oud. Top notes of pink pepper, candied bergamot peel and saffron are complemented by heart notes of rose attar, orange blossom and coriander seed. Base notes of French vanilla absolute, oud wood and amber round off this luxurious fragrance perfectly." Blue Diamond Oud ~ "Blue Diamond Oud parfum by Bella Bellissima is a floral, fruity amber oud. Top notes of mimosa, star anise, cassis and Roman chamomile blend with heart notes of apricot blossom, neroli, orris root and amber. Base notes of caramel, tonka, leather and musk round off this luxurious fragrance perfectly." Ruby Oud ~ "Ruby Oud parfum by Bella Bellissima is an amber spicy oud. It combines top notes of red chilli, heliotrope and saffron are complemented with a woody heart of tobacco leaves, myrrh and patchouli. This luxurious fragrance is finished with a base of vetiver, labdanum resin, sandalwood, amber, vanilla, and musk." Bella Bellissima Emerald Oud, Blue Diamond Oud and Ruby Oud can be found now at Selfridges in the UK, in 50 ml Parfum. Arrgggh…the neverending oud story …how ’bout Rainbow Oud or Psychedelic Oud …. Ooooh, I will buy Psychedelic Oud! Psychedelic Oud, good to wear while listening to Pink Floyd:). Oud…oud…oudoudoud…the word has lost all meaning. I don’t actually own any Oud fragrances – I am just tired of reading about them. The Ruby one sounds good to me though. Chili pepper, heliotrope, and saffron are all underrepresented in my collection. Although saffron seems to be popping up more often? Maybe it’ll be the new Oud. I hope to get to try this someday.